Posted by Glenn Irvine in Commentary, Competitive, Media, Review. Socialtext released 3.0 late last week, with 2 new product offerings (Dashboard & People). Quite an impressive product lineup now. In particular, I like the licensing models and appliance approach presented by Socialtext, and expect this will extend to the new offering. I’m keen to see what will be offered with the additional products here. IBM could learn a thing or two from the licensing models offered by Socialtext. Appliances make the configuration issues easier to digest by the clients. Posted by Glenn Irvine in Blog, Commentary, Media, Uncategorized. I was contemplating Mr Lepofsky’s move to SocialText, and started investigating the organisation, which led to a few discoveries. First – There is an interesting initiative underway between IBM and SocialText to integrate the SocialText Workspace with the Lotus Connections Product. I will be trying the 14 day trial of SocialText Workspace to better understand the synergies here. 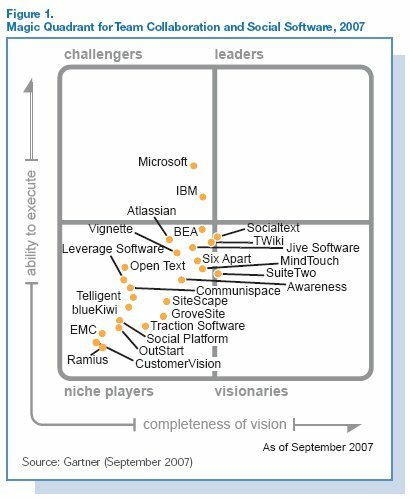 On the page of SocialText’s website that described the collaboration with IBM, there is a reference to Gartner’s 2007 Magic Quadrant Report on Social Computing and Collaboration, which is a good read. Here’s the actual Magic Quadrant Diagram. I also noticed an article in today’s ComputerWorld (online) about Social Networking titled “Enterprises the battleground for social networking” also an interesting read, with an interesting comment about how IBM employees have more registered users of LinkedIn than Connections. There is an obvious dynamic in that fact, but noteworthy anyway. Posted by Glenn Irvine in Blog, Commentary. All the best to Alan… I have followed his blog second only to Ed Brill’s for some time now, and SocialText will be picking up a great asset in Alan. With the Lotus Foundations breakfast, I see a great potential with this product for the micro to small business market here in Australia. I’m hoping the Bluewash process doesn’t take the shine off the Nitix value proposition for their products. I was impressed with the ease of install demonstrated by Matt Webb in the presentation. The article on Social Networking is an excellent one, and in summary nails some important issues with the 6 main points the author has made. Thou shalt ask: Do I want to explain this to an employer in 10 years? Or to my boss now? And finally, The official launch of the 3G iPhone here in Australia takes place in some stores in less than 2 hours with midnight openings in the major CBDs… I’m going to wait for the civilised opening of a local telco franchise in the morning (Too old to be queuing in the middle of winter at Midnight), and besides, I’ve had an iPhone for the last 9 months or so, so the wow factor is well and truely past. I am however looking forward to the 3G capability as I have had to settle for the Wireless connectivity to date. I will be very keen to see the new iNotes functionality in 8.0.2 for supporting the iPhone. So far the best I have had is wireless access to Webmail… You can read it but not author new emails. I’m looking forward to posting my next Blog entry via the 3G capability on the iPhone tomorrow!